On this page you’ll find everything you need to know about Bissell Little Green Proheat carpet cleaners. There are numerous models available in this line; however we will be paying attention to the best and most highly consumer rated models. The Bissell line of little green machines is definitely attractive with their semi-circular green design. They are ergonomically made and fit snugly into the palm of your hand. The main purpose of these machines is to spot clean stains on your carpet as well as clean stairs and other small tight spaces. This model is unfortunately being phased out and being replaced with the Bissell SpotClean Anywhere Portable Carpet Cleaner, 97491. You might still be able to find it as a used product and it is well worth the buy. This is a powerful miniature steam vac that can be used to clean spots on your carpet, automobile interior, upholstery, rugs and much more. It has a built in heater which ensures that the water and cleaning solution remains hot. This machine injects cleaning solution into the affected area and then suctions out the stain and remaining solution. t offers convenience, extreme portability and a huge cleaning punch. If you have pets or your carpets are prone to suffer spills and messes, you definitely need one of these in your arsenal. So what do consumers say about this product? Actual consumer reviews will always reveal the truth about any product. Many customers liked that this deep cleaner cleans extremely well especially pet stains on even the whitest carpets. The turbo brush also works well to remove those embedded stains and dirt. Some folks have had some repair issues, however most of the time this is caused by using the incorrect cleaning solution. It is recommended that your purchase only the Bissell’s brand of cleaning formula for this machine. The long power cord is also another plus which enhances portability. This next Little green machine is also highly rated and is the most affordable of the three. It has a high rating from many reviews and is a very good buy at the price. The features include a 2-3/4 amp motor, 15 foot power cord and is manufactured using earth friendly materials. It has a 95% reduction in the amount of PVC used and instead uses recyclable polypropylene made from recycled materials. It is designed to be extremely easy to clean up after and all it requires is a quick rinse when you’re finished using it. You can use this cleaner for your carpets, upholstery and other materials. It has a powerful spray and suction which will ensure that it drives out the dirt and stains embedded in your carpet. Consumers liked that this is an extremely powerful cleaner without the heavy price tag. It is very simple to use, all you have to do is pour in the water and cleaning solution, plug it in and place it on the spill or stain. It takes a few minutes depending on the strength or size of the stain, but sure enough, it always returns your carpets to a pristine cleanliness. Have a problem with pet stains and odors? Consumers found that this compact cleaner worked extremely well and quickly dealt with such issues. One word of caution, this is a spot cleaner and not meant to replace a full sized upright cleaner. It makes a great addition to your cleaning arsenal that will prove extremely handy. It has an overall 4/5 star rating which is extremely good. It has a built in heater which can heat water up to 25 degrees Fahrenheit and is very easy to use. Since the structures of these machines are quite similar, I’ll just jump right into the consumer reviews. Consumer reviews have indicated that this cleaner does a great cleaning job and works well to clean micro suede couches and upholstery. One con is that it’s on the loud side; however, it is a vacuum type cleaner, so this should be expected. 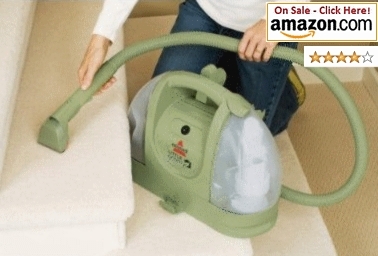 It is lightweight, portable and does an excellent job when you need to clean your stairs. Since it is small and compact, you can really save on storage space. It deals with kid messes – yes, that includes vomit and anything else your kid or family can throw at your carpet! 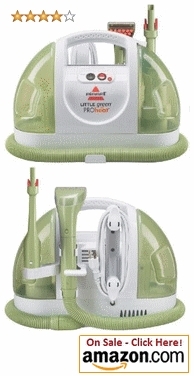 Overall, this Bissell Little Green provides good value for your money and is very affordable.